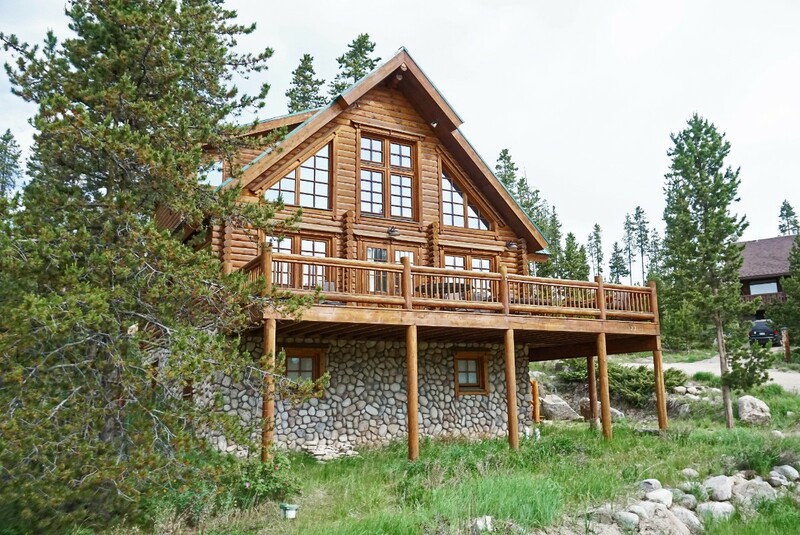 This beautiful log cabin home is new to the rental market for July 2018 and beyond. It offers you upscale quality finishes and furnishings throughout, large bedrooms, an open concept layout, and a large deck with nice views. The layout provides privacy as well as space to gather together. Each of the 3 levels has a bedroom and bathroom, and the main living area has enough space for the whole group. 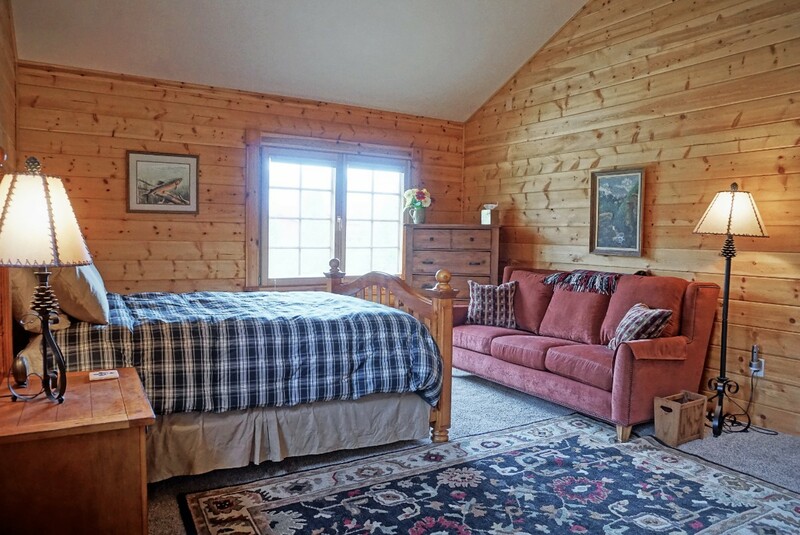 The bedrooms are set up perfectly for groups that have 2 couples plus 4 singles or kids, or even for groups that have up to 6 singles needing their own bed. 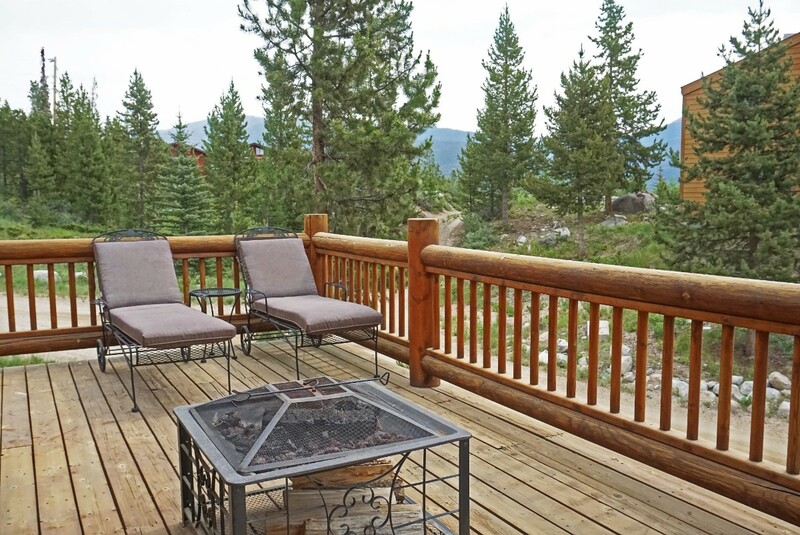 The location is very convenient, the outdoor space is ample, and the views are just good enough to get you excited about your plans for adventure. Please read on for more detailed information! One of the first things you'll notice about this home is the quality. It has beautiful hardwood floors, granite slab counters in the kitchen and all bathrooms, comfy furniture, nice decor, an efficient central heating system. 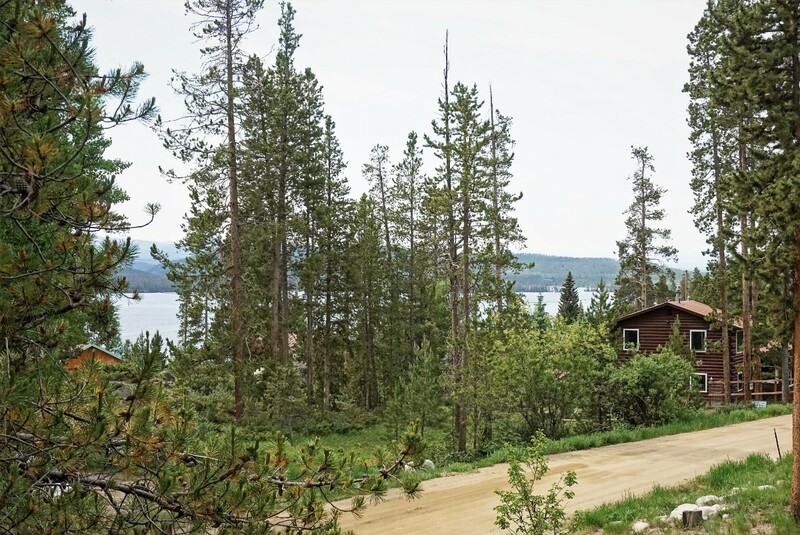 This home is relatively new, especially compared to most others in the Grand Lake area, and as such, it has finishes and appliances that are up to today's higher standards. 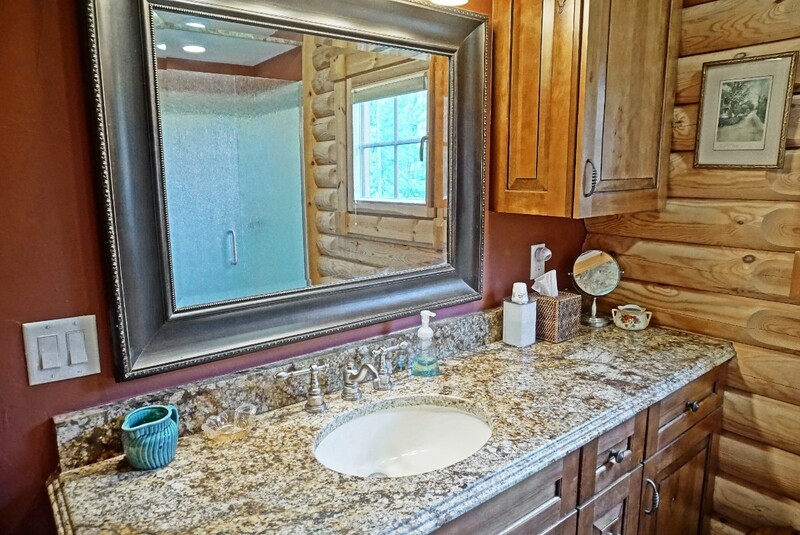 The renovation was so thorough that it included adding granite to the mantle over the fireplace, and as a decorative touch around the main level bathroom's shower. So the finishes Even better, because the home is pretty recently built, it has architectural features that older homes just don't. 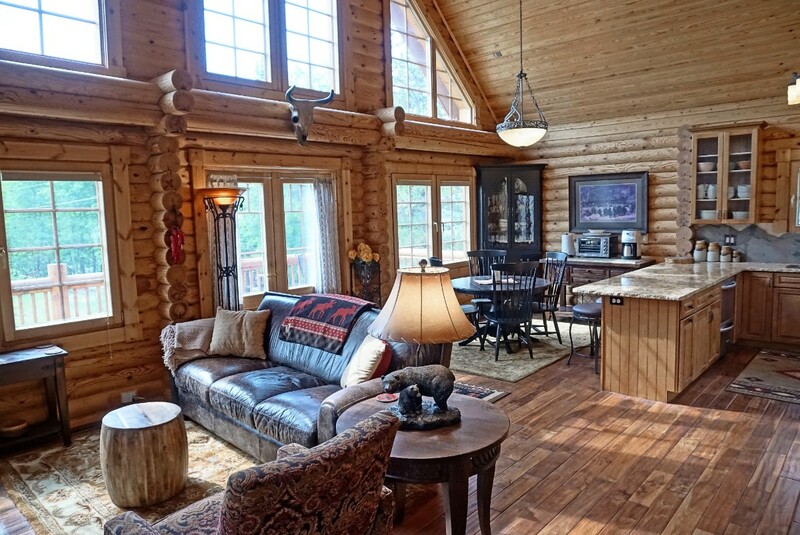 This includes features like the open concept living area, the vaulted ceilings with 2nd story windows, the very large bedrooms with walk in closets and attached bathrooms, as well as features that are harder to notice, such as the central heating system or the thick windows which are on hinges and have easy to operate blinds.. When you enter the home you'll love how spacious it feels and how nice it looks! 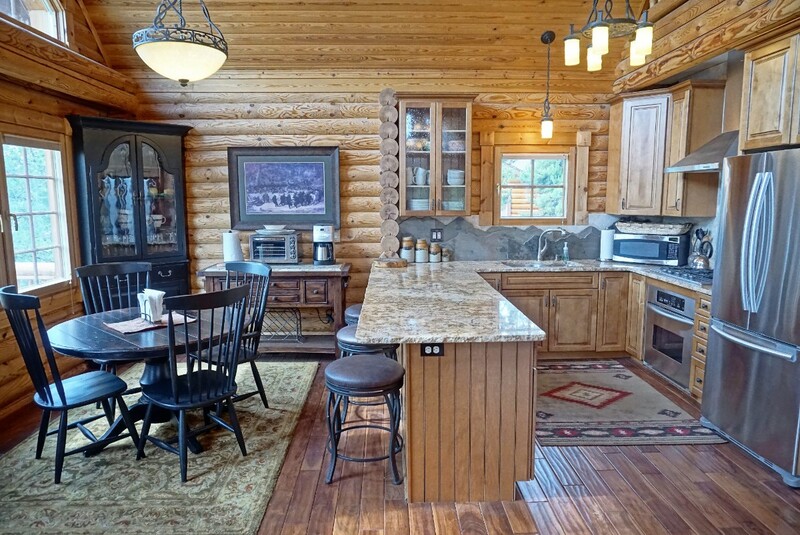 The main level has one very large great room which combines a living room area with the kitchen and dining rooms. 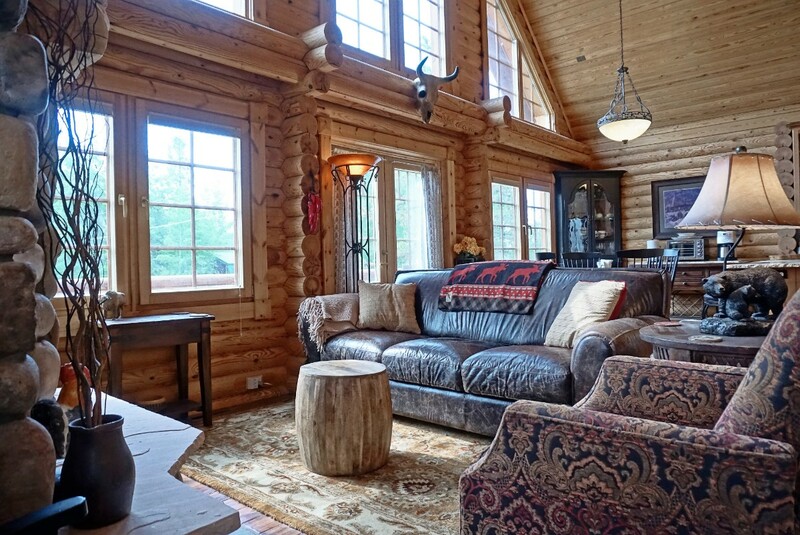 The living room area has a beautiful leather couch and a comfy recliner focused around the river rock fireplace. 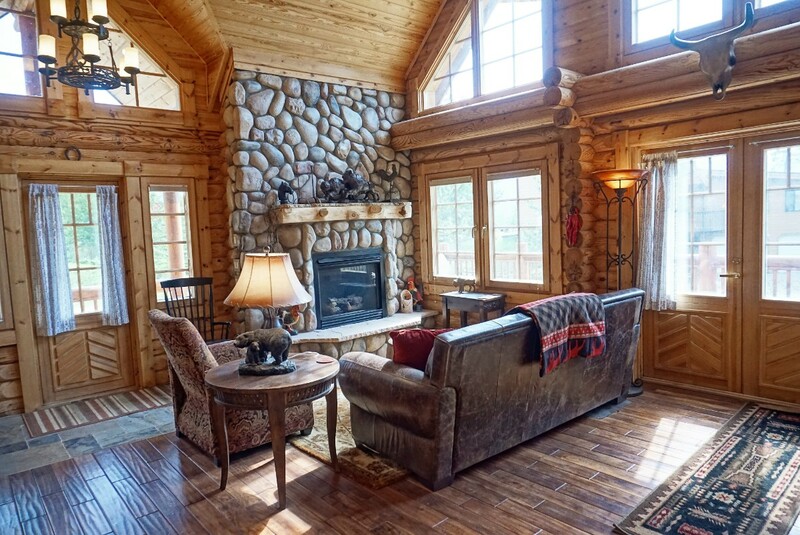 This is the perfect place to relax with a book or tablet. The tongue and groove ceilings start at about 10 feet high over the entry and fireplace, and vault up to a height of over 20 feet in the center of the room, where you'll find french doors leading out to the wraparound deck. The kitchen and dining area complement each other perfectly, and are cleverly designed to maximize utility and function. The dining area has a round table that seats 6 and would be ideal for some board games as well as dining. 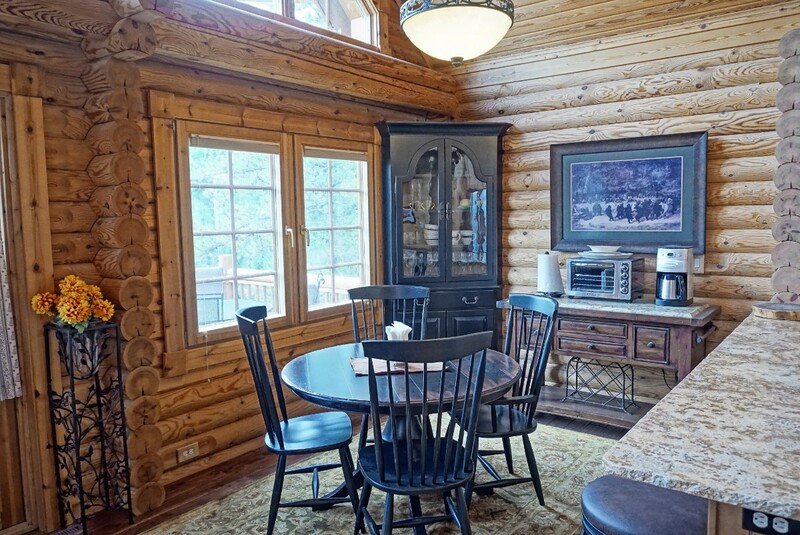 The dining area also has a coffee and buffet bar and corner china cabinet. 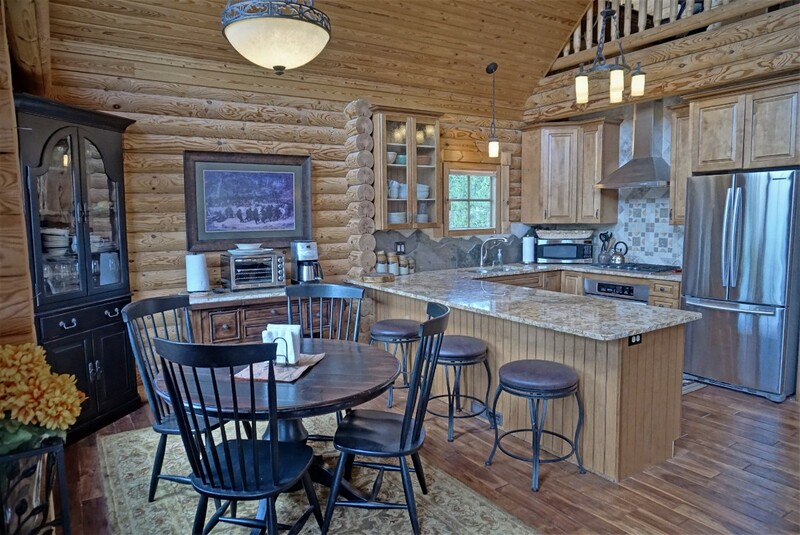 The kitchen peninsula provides easy service to the dining table plus more dining space with barstools for 3. 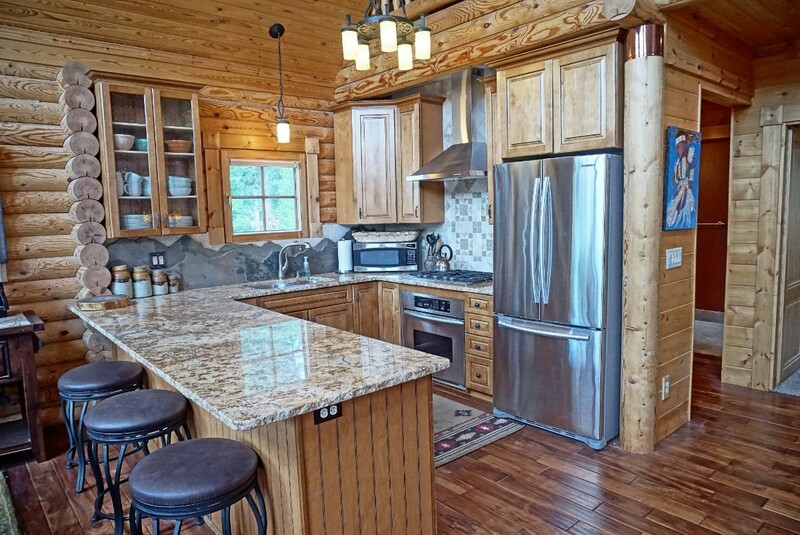 In the kitchen itself you'll find a double drawer dishwasher as well as double ovens. The range is a 5 burner gas range with ventilation hood. A beautiful french door fridge completes the stainless steel set. You'll find the kitchen to be more than fully equipped, with all the standard utensils, dishes, pots and plans, plus little extras too. The deck is off this main level, and wraps around the home from the front door then along the length living and dining rooms. 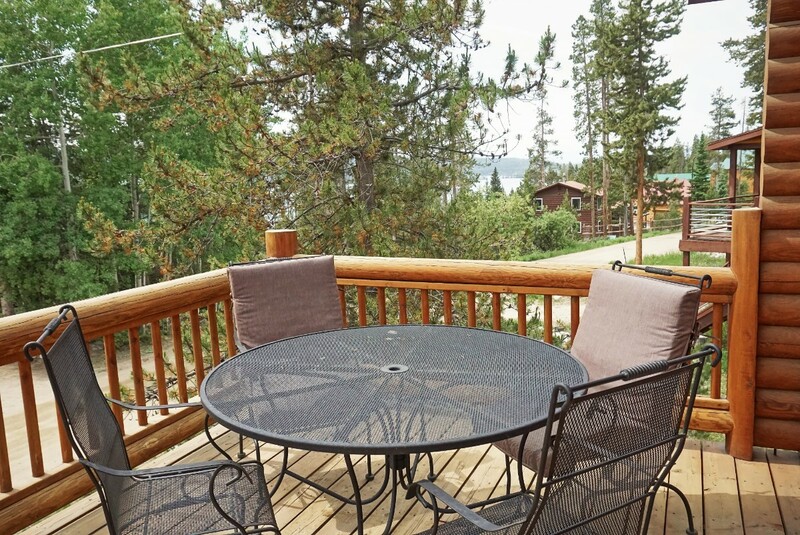 It is so long that there is plenty of room for an outdoor dining set, an outdoor fireplace, and a couple of chaise lounge sunbathing chairs. 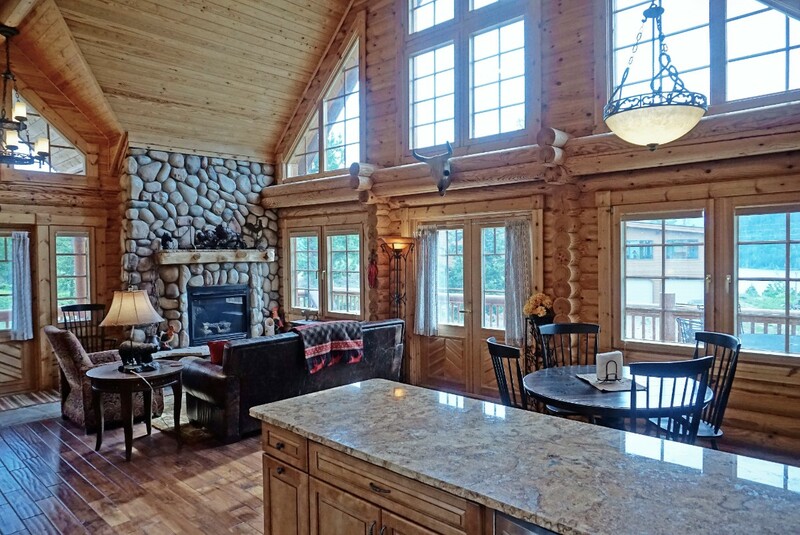 Back inside, the main level also includes the laundry room, a bedroom, and bathroom. 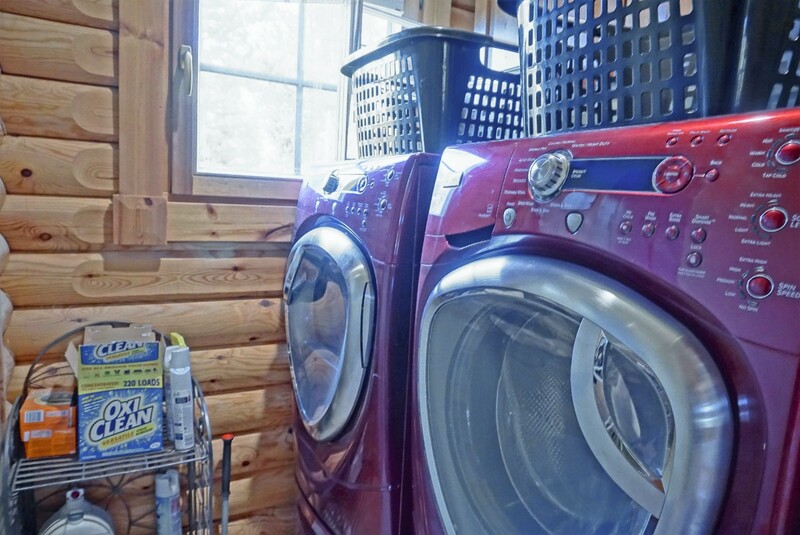 The laundry room has a newer high efficiency front loading washer and dryer set. The bedroom is quite spacious. It has a matching furniture set that includes the Queen bed, 2 night stands, a chest, and a dresser. With all of that, there is still space for one of the extra dining room chairs and a floor fan. 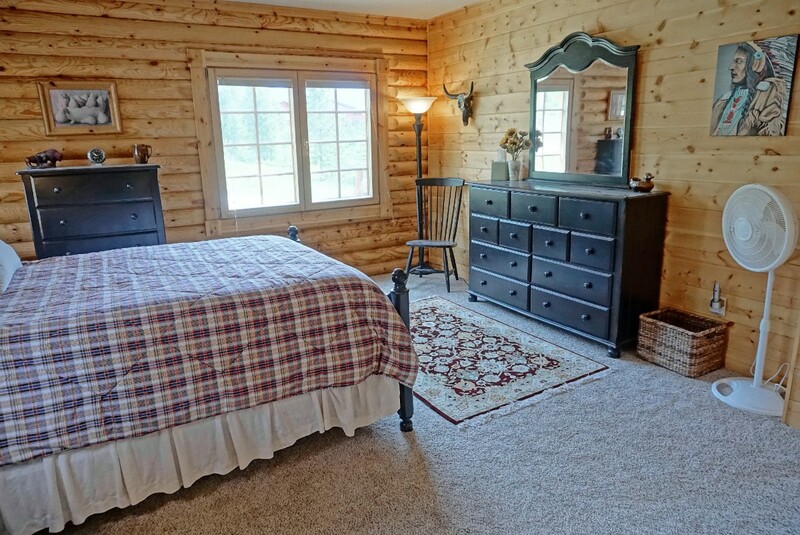 This bedroom also has a walk in closet and a bathroom. You can go directly into the bathroom from the bedroom, but the bathroom also has a door out to the hallway, so that others can use this bathroom without going through the bedroom. 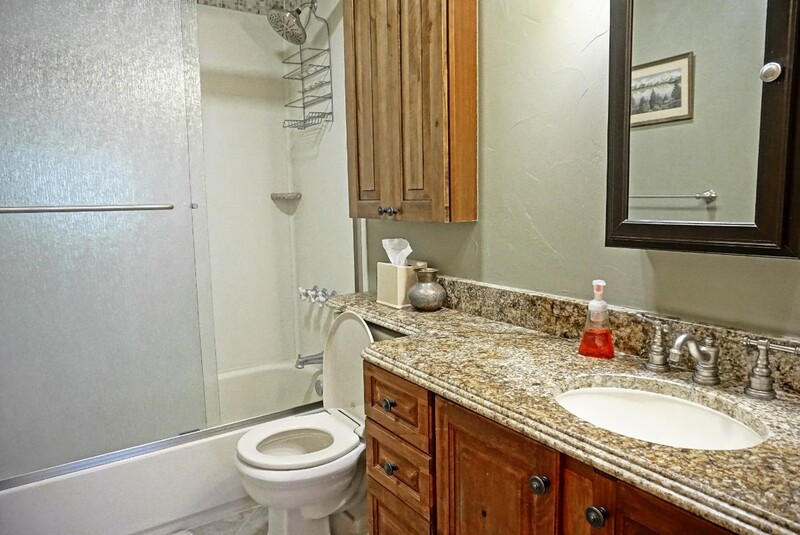 This main level bathroom has a lovely and large vanity as well as an oversized walk in shower. Head up the log frame stair case. 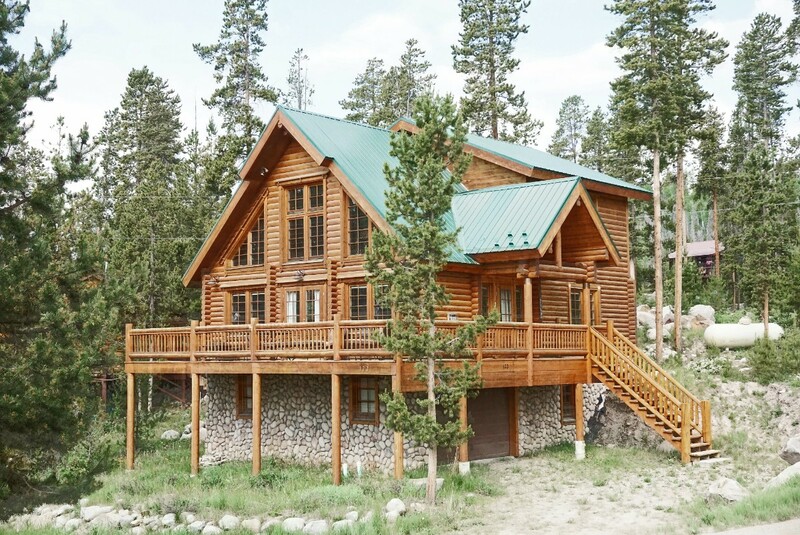 At the top, the landing has a commanding view of the great room below, and through the 2nd story windows, views of evergreen trees, mountains, and parts of Shadow Mountain Lake. 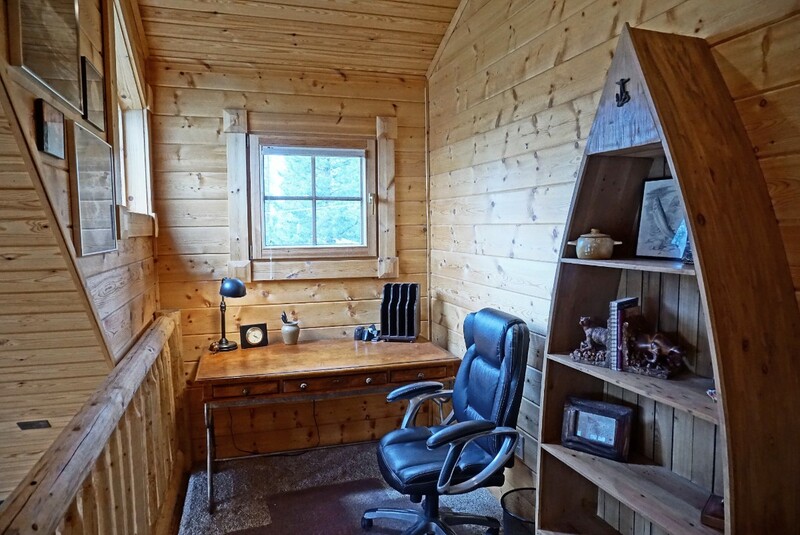 The far end of the landing has a nice little office nook, in case anyone in your group needs a place to do homework or office work. We hope that you don't use this space too much, but if you must, it is a comfy spot with good natural light. 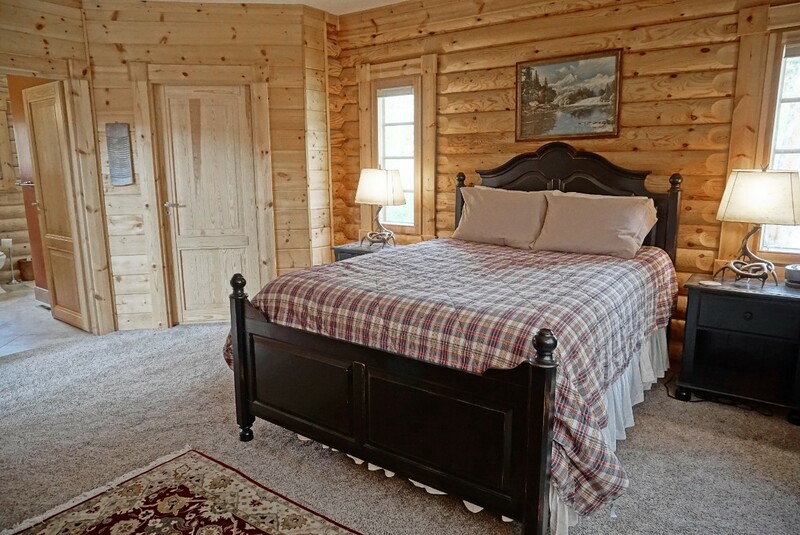 The upper level master bedroom, like the main level master bedroom, is really spacious. In fact, they are about the same size, but the upper level master has a few additional perks. 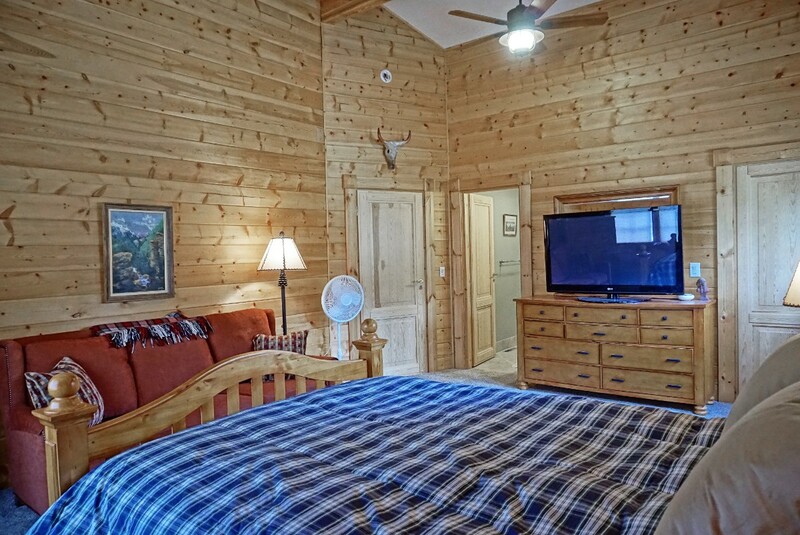 Again this bedroom has a matching furniture set which includes the Queen bed, night stands, chest, and dresser, but this room also has a full size sofa, very large HDTV, and vaulted ceilings. The walk in closet is extremely large, and the bathroom is a good size too. This bathroom has the same granite slab counters with bullnose edging as the others, but instead of an oversized shower, it has a bathtub/shower combo, which should be very helpful for groups with babies! Heading downstairs from the main level, you'll find the 3rd bedroom. 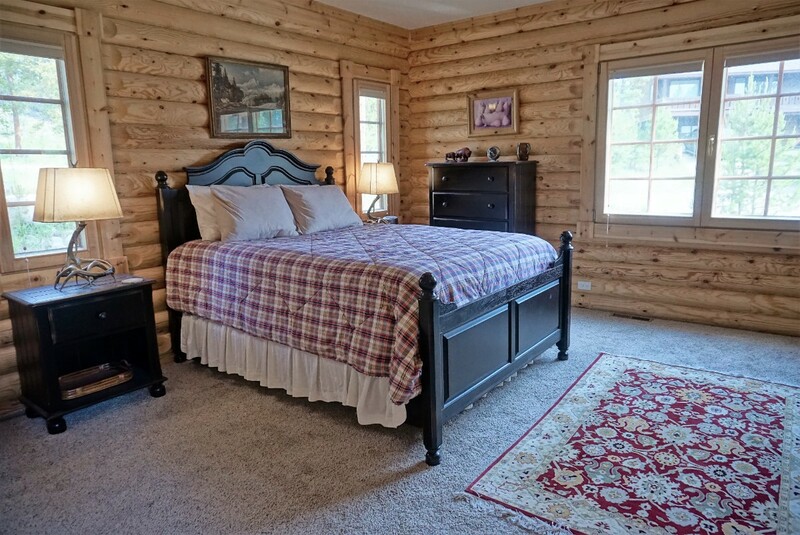 This bedroom is ideal for singles or kids, as it has 4 Twin beds. 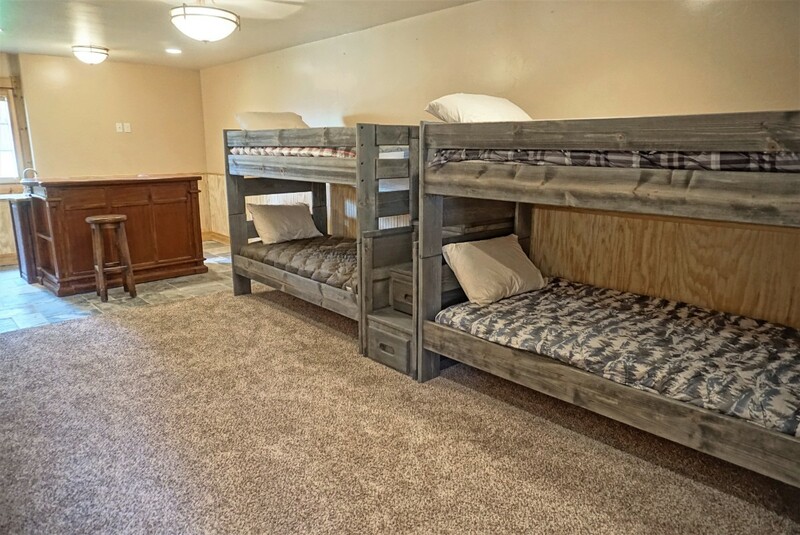 They are bunk beds, but don't worry, you don't have to climb up to the upper bunks! There are steps in the middle that will provide you with easy access to the upper level beds. 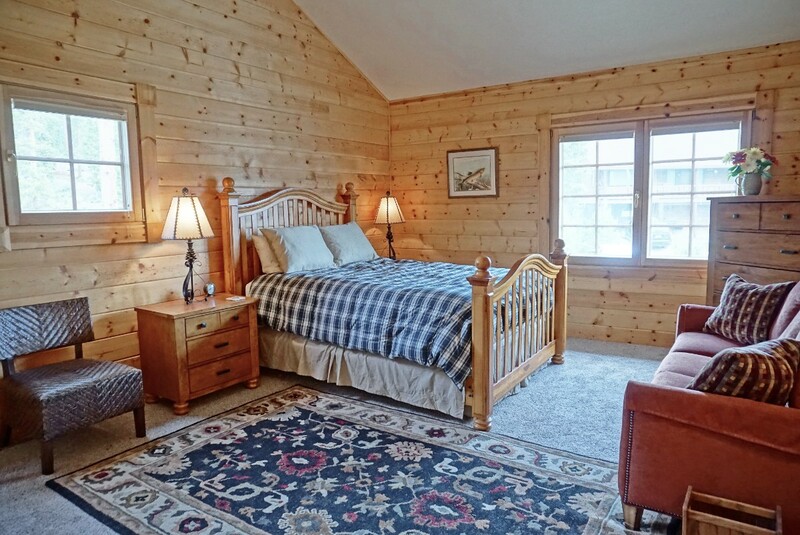 This extra long room has its own private bathroom which is updated nicely just like the others. The bedroom also has double sliding door closets for all the gear that might accompany 4 people, and no shortage of floor space either. This lower level stays nice and cool even on the hottest of summer days. Fortunately, there are not too many days when the heat is too bad, given the elevation of the Grand Lake area. So, this is a beautiful home with a great layout. The location is also one to appreciate. It is located less than 1/4 mile from highway 34, the only highway in the area. 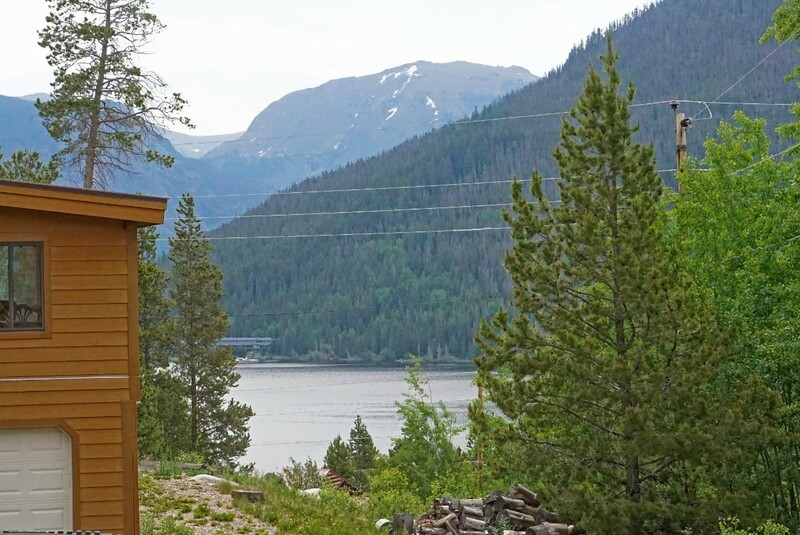 From this home, on highway 34, you'll have barely more than 1 mile before you have crossed into downtown Grand Lake or into Rocky Mountain National Park!. In the other direction, again only about a mile away, you'll find the Trail Ridge Marina, and Pine Beach, where the Colorado River flows into Shadow Mountain Lake, an area that is frequented by birds, elk, deer, and moose. 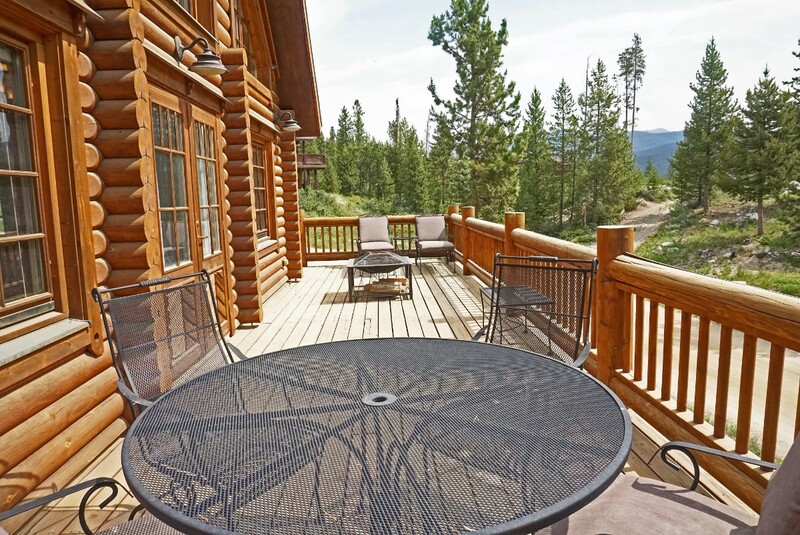 Before booking, please note: This home does have neighbors, some of whom are full time year round residents, so we seek respectful guests only please. While guests are not allowed to bring pets/dogs, the property owner does have dogs. So, while these are not at the property often, this home may not be suitable for those with allergies. Finally, you may notice a garage in the exterior photos. As of June 2018, this portion of the home is reserved for owner use only. 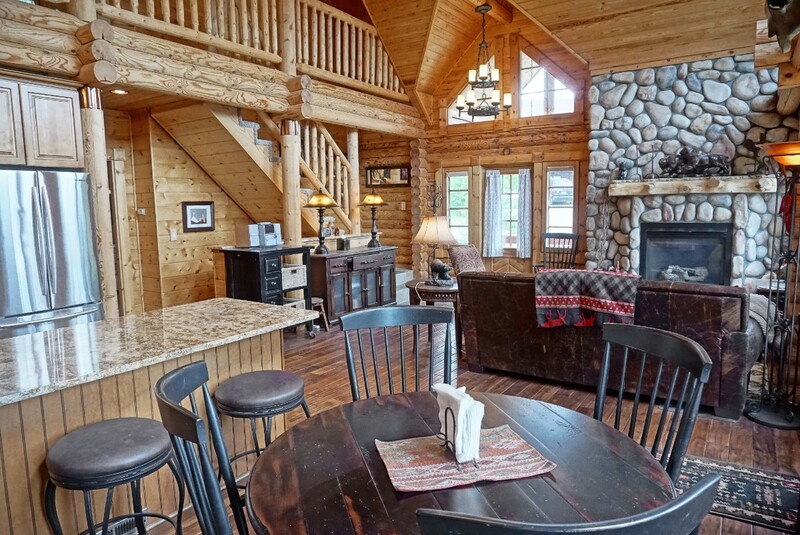 If this home sounds like the one for you, please book online with confidence, and one of our vacation rental specialists will be in touch to reconfirm the details of your reservation. If you have any questions, please call or inquire! We're here to help!